Chicago Gift Certificate Gift Certificates for Jewelry from Diamonds Chicago Jeweler. Gift Certificates for Jewelry in Chicago make great gift ideas. 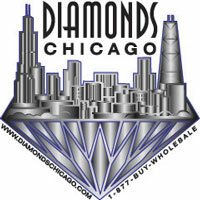 Diamonds Chicago offers gift certificates in any price. Gift certificates from jewelers in Chicago are great for any occasion especialy for Christmas, Chanukah and Birthday gift ideas. Gift Certificates make the Perfect Gift. Why not buy her a Gift Certificate and let her come in and choose her own diamond? Call 1-312-422-0400 to make an appointment to come in or purchase your gift certificates over the phone. If you don't see the denomonation that you want for your gift certificate, just call 1-312-422-0400.